The movement for the protection and liberation of animals is growing all the time. Many people work, interact and cooperate daily in order to protect animal rights. However, while humans have the ability to protect rights by writing laws and then follow them by means of reading, animals do not have that ability. They can not comprehend the concept of breaking a law or the sanctions which derive from a law. That fact has encouraged many people to claim that animals should not be subject to law, and, subsequently, they should be denied any rights. Do they truly have the arguments to support their case? To say that one should not acknowledge certain rights to beings which can not comprehend laws is contradictory to current practice. Positive laws apply to many people who do not have the mental capacities to read, write or understand laws. These categories include mentally challenged or brain damaged people, or people who had difficulties in their development. But no matter how impossible it is for them to act in accordance with the law, they still have certain rights such as the right to life, physical integrity, freedom and expression of their free will. Human race decided long time ago that mental capacity of a person should have no influence on their content of rights. So should it have any influence when it comes to animals? Those who think that it should are a special sort of people, the kind that believes in a superior race. They also share something with the nazi phylosophy which said that all beings considered "unworthy, less capable" should be exterminated, or ,at the very least, exploited. When we apply this sort of thinking to animals, we get specism. Just because animals can not speak our language or dance our dances, they can be killed freely. Judging by criteria which are based on human culture and human achievements is wrong. Animals themselves are capable of certain things that humans can only dream about- they are capable of flight, infra-red vision, ultrasound, extrasensory perception, and many things that man has not even begun to understand. That does not mean that animals are less worthy, they are simply different. The battle for animal rights does not start from animals. It starts from people. Humans are the most powerful race on the planet, and they can destroy every species, including their own. Therefore, animals are not strong enough to fight the battle themselves. They need people to fight for them. They need people who acknowledge that all beings are equal. Different, but equal. Such people work together and make an effort to pass laws which protect the ones that can not speak nor write. The human race has evolved through centuries from a species which applied cruel laws of nature- such as the right to kill or enslave people or nations which were weaker- into a race which realized that physical inferiority does not indicate inferiority in a cultural or social development. On the contrary, physical inferiority can create moral and social characteristics that a physically superior person may never develop. And to preserve such achievements, humans have developed a legal and judiciary system to protect them. That is why today it is illegal to kill, torture or sterylize physically or mentally challenged people, a practice well known during the nazi regime. In fact, there are documents on the international level, such as the United Nations' Universal Declaration of Human Rights, which guarantee the protection of basic human rights on a global level. This charter does not differentiate between the weak and the strong, but declares that all human beings are born free and equal in dignity and rights. This sort of legal protection is crucial to the protection of rights. All of the above mentioned applies to animals, too. Without the rule of law, animal protection is impossible. To begin with, there should be a general document on a global level, which would declare certain "self-evident, unalienable" rights of animals. Rights which would acknowledge that animals have values, abilities and inner worth which ought to be respected and cherished. These values and abilities should be looked upon by humans and serve as a learning treasure to be preserved. Exploitation and torture of other living beings may only stand as an enduring obstacle toward progress of the human race. Many of today's animals do not have any rights. In rare cases, certain species, such as dogs and cats, are given legal protection. This only proves severe discrimination when it comes to animal rights. Species are not considered to have equal values. Humans cherish only the abilities which can help or suit people in certain ways. Cats are gentle, dogs are loyal, dolphins are friendly. A relationship which is based on this understanding can only be degrading towards animals, and recognizes animals only as therapeutes, guards or companions. Again, inner worth is ignored. That is why, when there is no need for the kind of values these animals provide us with, they become suitable to be only our food. The practice of eating cats and dogs in China or dolphins in Japan has been well documented. The battle for animal rights has just begun. It will finish once the human race realizes the true values of all animals. And these values should not be modeled upon man and his view of the world. Man should stop protecting only animals which hold value for man and start protecting all living beings, no matter how scary, ugly or mysterious they might seem. Because, in the end, it is our fears we have to face, and the most dominant among them is fear of what we might achieve and how we might evolve once we grant animals certain basic rights. How many times have we wondered what would we eat if it were not for animals, what would warm our skin and how we would test our cosmetics? Without granting animals their rights, we will never find out. But to say that the world without the exploitation of animals is impossible only means that we underestimate our powers and strenghts and still do not realize what man is capable of. 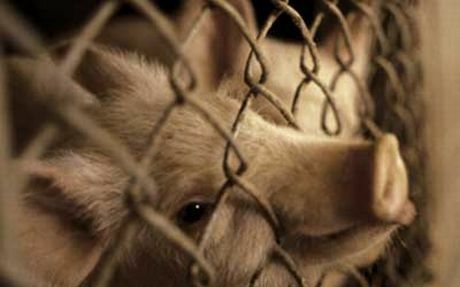 Granting certain rights to animals would ask of man to use his creative and inventive powers to resolve living conditions free of animal exploitation. This could lead toward another revolution, more comprehensive and more fundamental than any industrial or political revolution in history. Complete liberation of animals is the only means of liberation of man.